Monday November 25th 1895 It had snowed so the boys could not husk corn so they worked at the barn and Will washed and churned for one. It was an ugly afternoon but Will went to town. The boys banked up the house. I sewed what spare time I had. Knit in the evening. Tuesday November 26th 1895. Will went down town in the cutter. Oliver went to the timber and Seth was cutting wood. Will took me over the river in the afternoon. The Anderson family were all at Fanny's It was my first sleigh ride. After we came home Will brought the clothes from the line for me. Got supper and did evening work. 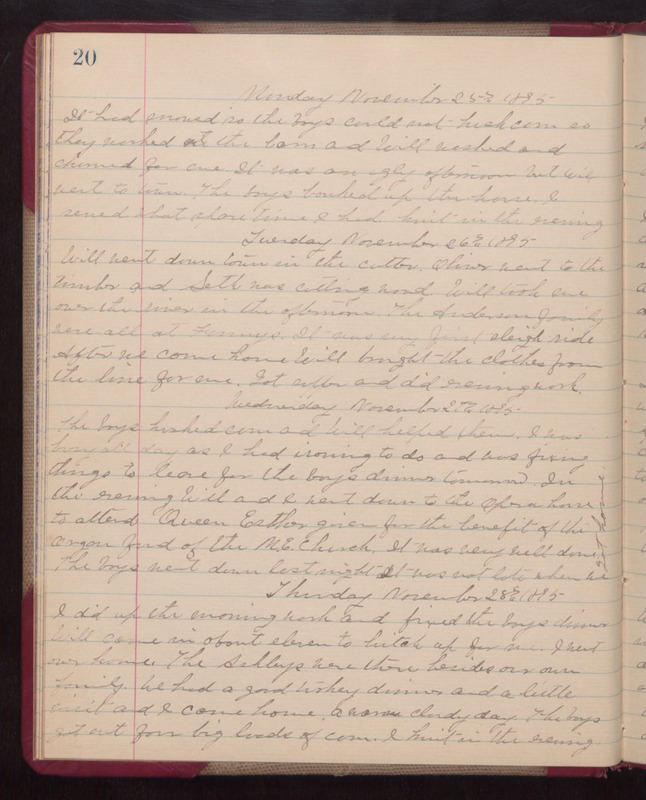 Wednesday November 21st 1895 The boys husked corn and Will helped them. I was busy all day as I had ironing to do and was fixing things to leave for the boys dinner tomorrow. In the evening Will and I went down to the Opera house to attend Queen Esther given for the benefit of the Oregon fund of the M. E. Church. It was very well done. The boys went down last night. It was not late when we got home. Thursday November 28th 1895 I did up the morning work and fixed the boys dinner. Will come in about eleven to hitch up for me. I went over home. The Ashleys were there besides our own family. We had a good turkey dinner and a little visit and I came home. a warm cloudy day. The boys got out four big loads of corn. I knit in the evening.